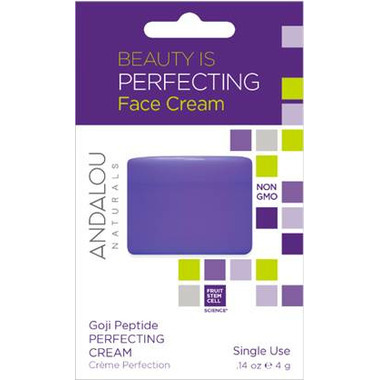 ANDALOU naturals Age Defying Goji Peptide Perfecting Cream now comes in a convenient single use pod. ANDALOU naturals Advanced Fruit Stem Cell Science renews skin at the cellular level, blending nature and knowledge for visible Age Defying results. The Fruit Stem Cells, BioActive 8 Berry Complex, and Goji glycopeptides deliver collagen and elastin building actives deep into dermal layers, boosting cellular repair and renewal, dramatically transforming to firmer, brighter, younger-looking skin with fewer fine lines and wrinkles. Travelling -- so easy to throw in your bag and go! Testing -- try it before you buy the full size item!